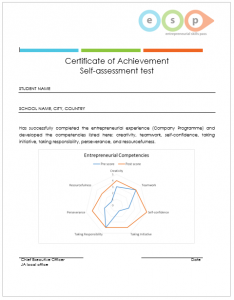 The objective of the self-assessment tool is to make students aware of the competences acquired through the mini-company experience and emphasize the role they play in the learning program. It targets students involved in the JA Company Program reflecting on their own progress in acquiring practically oriented skills and entrepreneurial attitudes throughout the year: creativity, self-confidence, teamwork, resourcefulness, perseverance, taking responsibility, and taking initiative (see the box below for further details). The questionnaires also include an evaluation of the key competences for lifelong learning (e.g. communication in mother tongue and in a foreign language, science and technology, math, digital competences, etc.). The use of imagination to create something, to identify an innovative solution, to come up with new ideas. The quality of being inventive, clever and original. The ability to cooperate, work or play with other people to achieve a common goal. This includes feelings of mutual trust, respect and friendship. Persistence in doing something despite difficulty or delay in achieving success. The ability to be determined and resolute until a person finishes what was started or achieves a good result. Feeling able to do something and being positive and certain of one’s abilities and qualities. This includes also the ability to accept failures and to learn from them. Behaviour characterised by its self-starting nature and its proactive approach. This includes the ability to use one’s knowledge, to cope with the unexpected and to transform a problem in action to be taken or in an opportunity. Being aware and taking ownership of having aduty to deal This means doing what needs to be done and to achieve what has been agreed with someone else (e.g. group, organisation or myself). The ability to observe an environment or a situation and to understand how to be a player in it. This includes the ability to identify one’s skills and potential and to look for what a person needs to cope with the environment/situation. Teachers are provided with teaching materials to support students’ understanding of the concepts behind the self-assessment and their main role in this phase is to provide feedback and discuss the results in the classroom on the basis of a radar chart students get on their certificate after taking the pre and post self-assessment questionnaire. Students must have completed the two questionnaires of the self-assessment in order to qualify to take the ESP final exam. The exam, as a final step to earn the ESP certificate, aims at assessing, validating and certifying students’ theoretical and factual knowledge as well as their cognitive and practical skills about the most important business issues and concepts. It is delivered under the supervision of a teacher and through an online platform that is available only in specialised test centres. A pool of almost 300 questions is available to the students together with a demo (exam example) used as training exercise. During the exam, the technical system presents each student with 28 questions randomly extracted from the database. Since there is a direct link between the activities experienced in the the JA Company Program and the exam, its questions focus on skill-based tasks with emphasis on applied understanding and practical scenarios rather than solely assessing knowledge and factual recall. Only the students fully participating in the three elements of the ESP and correctly answering 70% of the questions of the exam receive the final certificate, which is issued at international level by CSR Europe, EUROCHAMBRES and JA Europe and its member organisations. The final certificates are delivered automatically through the exam platform and are based on a validation process that works through a QR code placed in the back page of the certificate. 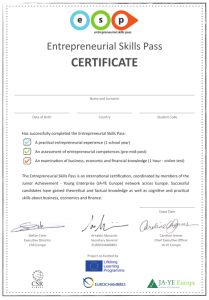 Successful candidates, after getting the certificate, have the possibility to access further opportunities offered by small and large businesses, top higher institutions and international organisations across Europe.